This view is extremely human-centred and techno-capitalistic, and focuses solely on human needs and aspirations. The rest of nature are reduced to mere resources, placed at our disposal to exploit. This view of sustainability has some major implications. It means that anything we do today that hinders the possibility or reduces the opportunity space for us and other lifeforms to flourish in the future, is by definition unsustainable. Because it reduces the breadth of potential futures, this type of activity can also be called defuturing. Today, what most businesses do in the name of the environment really amounts to an effort to reduce unsustainability (Ehrenfeld, 2006). Whilst this can be better than nothing, a mere reduction does not make an operation sustainable, and is often designed to distract consumers from investigating the deeper problems. Greenwashing and many ‘ethical’ or ‘organic’ products are common examples of this. Let’s have a more detailed look at some of the problems with production. The three basic factors of production are natural resources, labour, and capital. Extractive activities are, by their very definition, unsustainable. Notes: This list above is not exhaustive. For simplicity, emissions have been grouped under extractive activities. Depending on your perspective, emissions, pollution, abuse of the commons, environmental degradation and biodiversity loss could all be categorised as both extractive and exploitative. Also, ‘renewable’ energy sources such as biofuels have their own complexities, which are not discussed here. 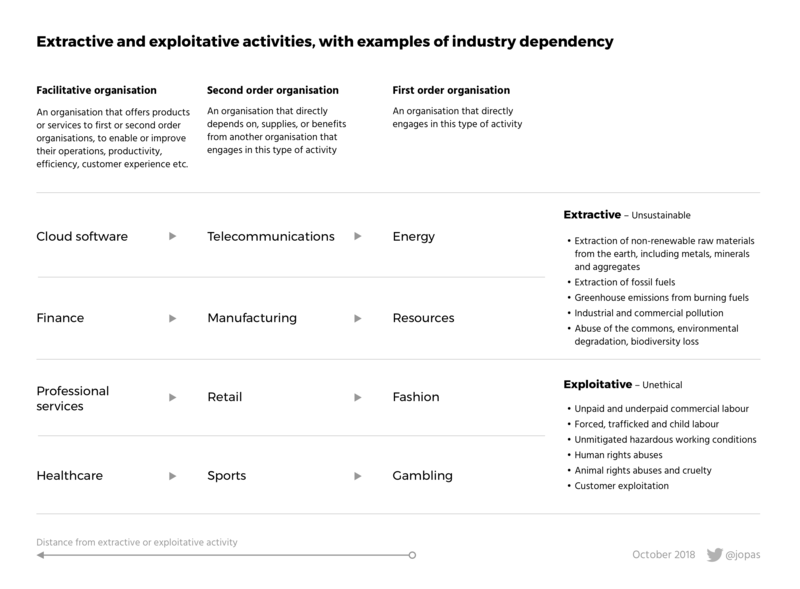 Some industries also exploit their customers: addiction (alcohol, drugs, tobacco, some games), gambling, predatory credit, perhaps some cosmetic plastic surgery, and so on. Exploitative activities are, by their very definition, unethical. These activities can also be considered unsustainable as they work against the long-term flourishing of certain groups of people or other natural life. Note: I am aware that these two categories may be read as reinforcing the classic duality of human vs. nature, which places humans separate to nature, and depicts nature as ‘other’. That is not my intent. The third factor of production, capital, is a story for another day. Just one salient point: the built-in profit motive that is core to capitalism means that the system ‘naturally’ reorganises towards the cheap, in every interaction. This means that there is always an incentive for a race to the bottom, which in turn fuels extractive and exploitative activities. There is a complex interrelated network of structural causes and effects that contribute to the wicked problem of unsustainability. I won’t go into further detail here but themes like patriarchy, individualism, dispossession, financialisation, colonisation, oppression, racism and structural inequality all have a part to play. Let’s call these systemic problems. The following table is an attempt to illustrate a very high-level view of the supply chain using four simplified examples of interdependent industries. To make these examples more realistic, you can replace each industry with an actual company name. Facilitative organisation: An organisation that offers products or services to first or second order organisations, to enable or improve their operations, productivity, efficiency, customer experience etc. The further away you are from the core extractive or exploitative activities, the easier it is to claim ‘sustainable’ or ‘ethical’ operation. The trouble is, your operation still depends on, supplies, or benefits from these unsustainable or unethical activities by proxy. Think about a basic consumer product, the chocolate bar. The following diagram from TDT Victoria shows how complex the supply chain for this deceivingly simple product is – and this is just a high-level view! You can imagine that the global supply chain networks are infinitely complex and it is almost impossible to assess the full extent of interdependencies for all but the most basic of products. 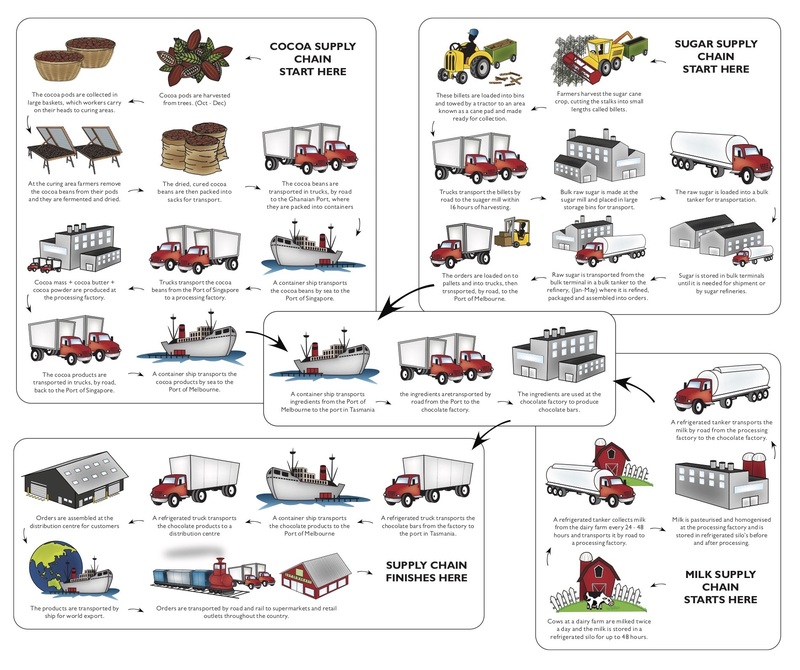 If you count the trucks, trains and ships in the above diagram, you can see how much of the supply chain is just moving goods and materials around – this illustrates the system’s addiction to cheap energy. Every single stage of this transportation journey has its own environmental impact and emissions. Therefore, to understand the full extent of the environmental impact of even the simplest product, we would have to consider every nested supply chain that underpins each part of the product. 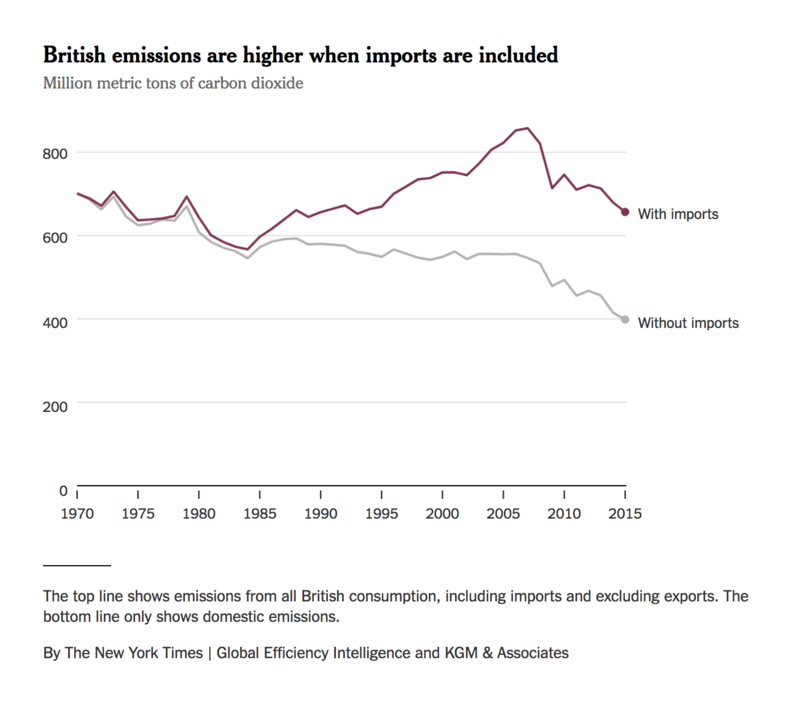 A recent article in the New York Times touches on this very complexity through the example of outsourced emissions. The diagram above illustrates how significant a difference it makes to either include or exclude these emissions. Measuring emissions is in part an accounting problem, and some creative accounting is being employed here to make emissions reductions look better than they really are. Although not all extractive activities result in emissions, we can use embodied emissions as a shorthand to consider the effects of these activities as they carry through the whole product lifecycle. To build on the concept of embodied emissions, we can also consider the notion of embodied exploitation. These are the ethical breaches and abuses of people and animals that took place during the entire lifecycle of a product, across the entire supply chain network. Conversely, a product cannot be sustainable if any part of its manufacture, distribution, consumption or disposal – including all dependencies – is unsustainable. Now, have a look around your home or your office. Everything you see is a product. Choose one of them, touch it, pick it up – certain materials were used to manufacture it. These materials were extracted somewhere, repeatedly transported somewhere else, put through various industrial processes, then delivered through the system of commerce, to you. For each of these steps, certain people were involved, either as paid or unwilling participants to the supply chain and the global industrial system. Whichever product you’re looking at, the likelihood of every one of the hundreds or thousands of steps required to bring it to you being carbon neutral, non-extractive and non-exploitative is virtually zero. Here’s the real kicker – now think about your job. Perhaps you’re doing an office job, or maybe you work out in the world. Given Ehrenfeld’s definition, how many of the tasks you do on a daily basis can be considered sustainable? What about the solutions and outcomes you create, and the clients and customers you serve – can their operations be considered sustainable? What about their clients and customers? And the chain continues. We are all trapped in a system we no longer control. The system is unsustainable to its very core. Let’s start afresh and imagine a better system. All content copyright © Jussi Pasanen and respective owners, as referenced. This essay was originally written in September 2018 and published in November 2018. Thanks to everyone who reviewed versions of it.